Spending days at sea on research ships in the Gulf of Mexico may not be how typical Aggie undergraduate students spend their time in between classes, but for junior Victoria Scriven, it’s nothing out of the ordinary. That’s because Scriven is one of the first students in the oceanography undergraduate degree program at Texas A&M University. Fall 2017 was the inaugural semester of the Texas A&M Department of Oceanography’s undergraduate program, and the pioneering students have gotten to take advantage of unique hands-on research opportunities and faculty mentoring. One thing these soon-to-be Aggie oceanographers have in common is a deep passion for the world’s oceans. “I always knew I loved the ocean; it is where I feel like I belong,” said sophomore Samantha Longridge. "My dad, Kent Longridge ’91, graduated from A&M and he has his master’s in ocean engineering, so he has a passion for the ocean." 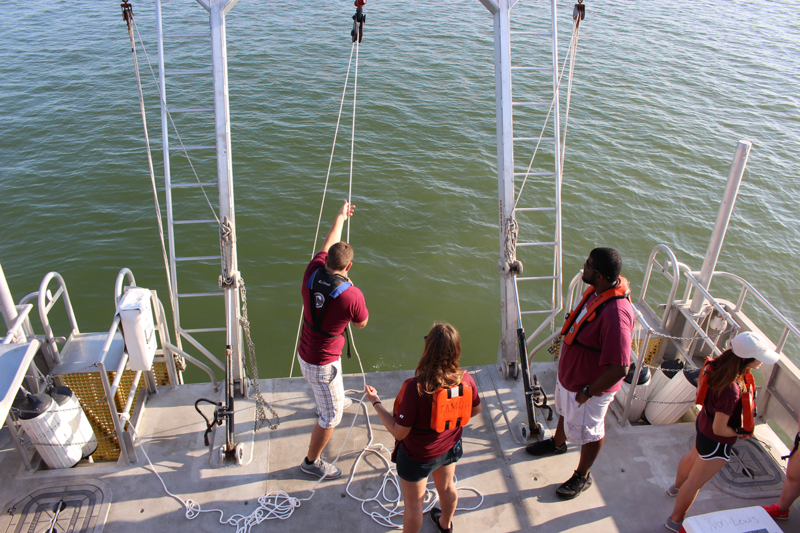 Oceanography students conducting researh aboard the RV Trident in Galveston Bay on Nov. 4. Texas A&M has long offered graduate and doctoral degrees in oceanography, and received state approval to add the undergraduate program in December 2016. “The Department of Oceanography is very excited to be able to offer this new STEM degree, the B.S. degree in Oceanography.” Dr. Shari Yvon-Lewis, professor and interim oceanography department head, said. 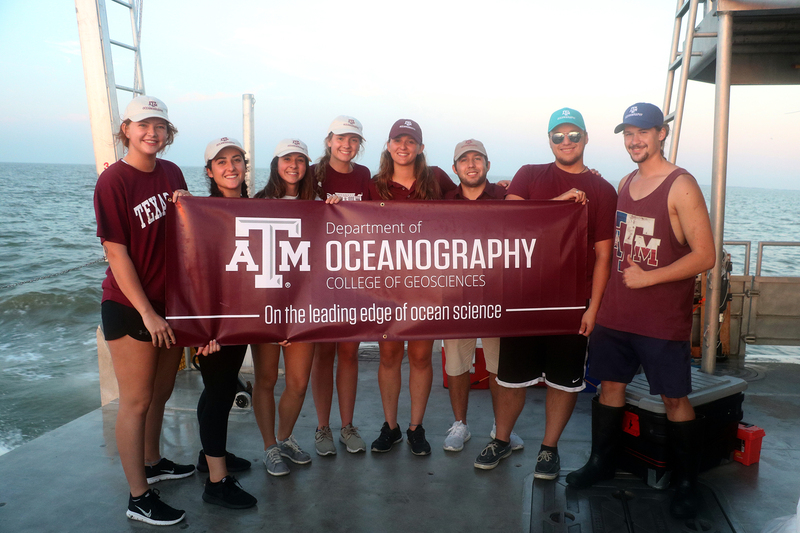 The students agreed that one thing that makes Texas A&M’s undergraduate oceanography program so unique is that “you can tell all the professors are really into what they are teaching,” Longridge said. “I took Oceanography 251 with Dr. David Brooks, and he was so passionate about it, you could just tell that he loved it,” she said. The size of the program also plays a role in its uniqueness. Undergraduate students aboard the RV Trident in Galveston Bay on Nov. 4, from left to right: Kelsey Gibbons, oceanography major; Cassie Oswood, OCNG 491 student; Ana Ramos, oceanography major; Samantha Longridge, oceanography major; Victoria Scriven, oceanography major; James Chapman, oceanography major; Cody Padlo, OCNG 491 student; Brian Buckingham, TAMU-GERG student worker. “Research experiences, including field, lab and modeling studies, are necessary for students to get that hands-on experience,” Yvon-Lewis said. As for the future, both Scriven and Longridge plan to attend graduate school. Get more information on the oceanography degree program. Undergraduate oceanography students on a research cruise in Galveston Bay aboard the RV Trident on Nov. 4.